YouTube is a great way to enjoy user-uploaded videos on just about any subject. It is not only watched by almost everyone on smartphones, but you have lots of ways to access and watch it on your TV. 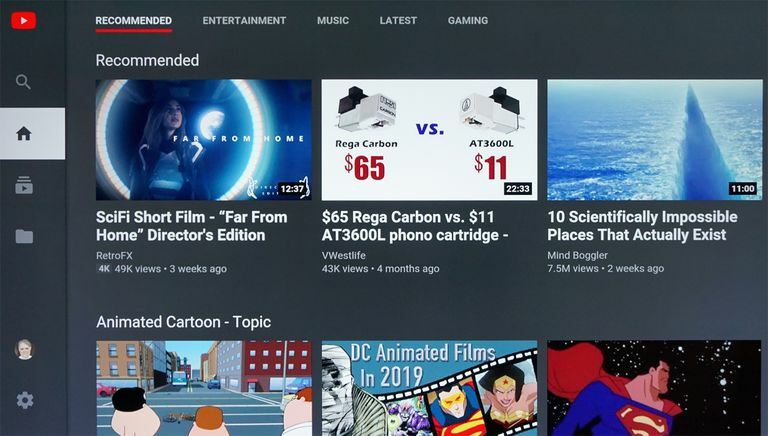 If you have a smart TV, with very few exceptions, the YouTube App is either pre-installed or available to add to your viewing list via the TV's built-in app selection or store. Plug-in media streaming devices, such as Apple TV, Nvidia Shield, and Roku have the YouTube app pre-installed. If it isn't pre-installed, you can download and install it using the device's "app store". Another type of media streamer that plugs into your TV, Google Chromecast, requires you to "cast" YouTube to your TV with the app installed on your smartphone. Due to an ongoing dispute between Google (the owners of YouTube) and Amazon, the app version of YouTube is not available for Fire TV devices (sticks, boxes, Fire Edition TVs). As a workaround, Amazon provides an app that allows you to access the YouTube.com website via its available Silk or Firefox web browsers. You can watch YouTube on your TV from a Nintendo Switch, PlayStation 3/4, or Xbox game console. The YouTube app may be pre-installed or accessible via an associated app list or store. Although YouTube is accessible on every computer that is connected to the internet, with an HDMI cable, you can connect your PC/Laptop to your TV and watch YouTube on a bigger screen. Although their primary emphasis is the reception and recording of TV programs, select DVRs, such as the TIVO Bolt/Bolt OTA and Channel Master Stream+ include built-in access to select streaming apps, such as YouTube. Although select DVRs provide access to YouTube for live viewing, they don't allow recording of YouTube (or other streaming apps) onto their built-in hard drives. Almost all Blu-ray and Ultra HD Blu-ray players include access to a host of streaming apps, which, in most cases, includes YouTube. This is a great option if you don't have a smart TV or an add-on media streaming box or stick. The app is usually pre-installed, but just like the other options discussed, you can add it via the player's app store. Press the Home or Start Menu for your TV or another device. Select the TV or device's App Store (may also be labeled More Apps, Channel Store (Roku), or via brand name, such as Samsung Apps). Find the YouTube App. If your TV or device has an app search feature, just type in YouTube and the app icon should be displayed. Click the YouTube App icon and select Add or Install. After installation, the YouTube app should be placed in your app viewing menu. If you have the YouTube app installed on your smartphone or tablet (you can add it through the iTunes for iOS, or Google Play Store, for Android), you can use Screen Mirroring (Miracast) or Screen Casting to send YouTube wirelessly to a compatible smart TV directly (No physical HDMI or other type of connection required), or through a media streamer (such as Chromecast), Blu-ray Disc player, or game console that supports either of those features via HDMI connection. Go to Settings on the YouTube Home Screen on your TV or the compatible device connected to your TV that is providing YouTube. Select Link with TV Code and note the Code provided on the right side of the screen (fuzzed out in the example for security). Open the YouTube App on your compatible smartphone and tap the Account icon on the top right corner. On the account page, tap Settings. In Settings, tap Watch on TV. Tap the TV or device connected to your TV that you want to use, and enter the TV Code provided by your TV in Step 2. Your Smartphone may also provide an automatic link option that does not require entering a TV Code as shown below. When you start playing YouTube on our smartphone, it will also play on your TV. You may also see an alternate Link TV and Phone option in YouTube Settings on your TV or device connected to your TV. If not grayed out you can click on it, scroll down to Link with TV Code, and enter that code in the YouTube app on your smartphone. Access to playback for the above video resolutions depends on which one was used by the content producer as well as your own internet streaming speed. YouTube will default to the closest resolution your TV or the device connected to it is compatible with in relation to your internet speed. YouTube Online Movie Rental Service. Pay-per-view movie viewing via YouTube. YouTube TV – This service that provides online access to a selection of 40+ broadcast/cable/satellite-like channels that includes a mixture of live and premium channels for a flat monthly fee.